With a thrilling mix of cultural and foodie influences from the Ottomans, Persia and various neighbouring countries (Israel, Syria, Jordan) this eastern Mediterranean cuisine is one of the most interesting around. 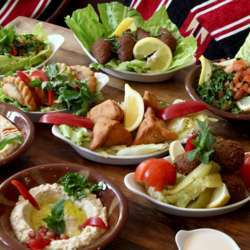 Piles of mezze dishes, beautiful breads and an insistence on packing fresh vegetables, herbs and spices into everything, means that there is something for everyone when it comes to Lebanese food. Let us try it! Consumption is a la carte, no fixed menu. BE THERE OR BE FAIR and cancel your attendance if you cannot make it.